These worksheets are an awesome way to get in some printing practice lower case letters. Hold that pencil just so and go for it! First, trace all the letters on the first line. On the next line trace three letters and write two more. Continue the pattern until you get to the last line. Then, write the letter five times. Each letter should be traced or written at least five times on each line. Awesome is how you'll do when tracing and writing the lower case a. Keep them nice and round with a short straight line. Write them five times per line. You get an A! Bring a buddy and begin practicing the lower case b. Trace and write each b as beautifully as can be. The bonus: Knowing you're a budding letter b writer. Don't crumble at the thought of tracing c's. It's the crowning achievement of your day! Trace and write the lower case c five times. You will certainly be glad you did. It can be doggone difficult to not get the b's and the d's mixed up. As you trace and write each lower case d say it out loud. Practice starting here five times per line. Which letter is used most frequently? You got it! The letter e. Write the lower case e five times on each line. You'll be writing this one an awful lot during your lifetime! Have fun with the fantastic letter lower case f. Trace and write five times on the lines. That's right five times. Don't cheat and try only four times. Remember, cheaters never prosper. The grass is always greener on the other side. Put lots of effort into writing the lower case g really nicely, and the grass will be green on your side, too. How hard can it be to trace the letters handily? Not hard at all. With ease and joy trace and write the lower case h straight and tall on the lines. Hurrah! You did it! You're a hero! Isn't the letter i incredible? 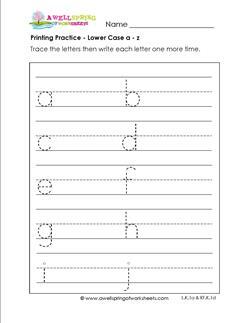 Without it we wouldn't have the word write, which is what you need to do on this lower case i printing practice page. Write, write, write! I insist! Have a jolly time today with lower case j. 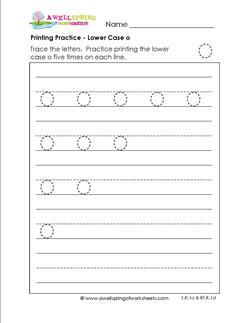 Trace and write the letter j five times on each line. Joy will flood your heart when you do your very best job... and I'm not jokin'. Keep your eyes on the page and don't be kooky. Trace and write the lower case k in a kingly way. Write the letters as if a whole kingdom were to see them. Lower case l is long and lean and is the easiest letter to write. Trace and write the letter l five times on each line - at least. Line them up straight and tall one after another. Look at all those m's. Doesn't it make you think of munching on something mmmm mmmm good, like m & ms! Trace and write all those lower case m's five times on each line. It's none other than... lower case n! Now center stage and no longer a newbie, n is the star of the show, ready to be traced and written nicely and neatly numerous times. The letter o is like an orange, simple and round. Trace and write the lower case o five times on each line. Offer an ovation for letter o, always so circular and fine. Instead of three peas in a pod, write five p's on each line. Trace each lower case p so they look perfect and pretty - never poorly printed. Write them so they are perfectly legible. No rushing is the only rule when writing the lower case r. Trace the r's first then write - regally not riotously - so there are five per line. And have a rip roarin' good time! Squiggly swirly s is one of the harder letters to write. Swirling one way, then the other, trace and write the lower case s simply and seamlessly, slithering like a snake - five times each line. Time to tend to lower case t. You don't have to write it a ton of times - just five times per line is fine. Trace them straight and trace them tall, and make that little line across the middle, too. Trace and write the lower case u five times on each line. Please understand that practicing will only make you unmistakably and utterly awesome at writing the letter u. Trace and write the lower case v five times (or more) on each line. No need to hurry or rush your way through. Take your time and viola! You will have written very nice v's. Learning to write letters neatly comes with practice. Practice tracing and writing the lower case w and you'll be a wonderful winner at writing w's! Trace the lower case x five times on the first line. It's like having training wheels on! Keep practicing and by the last line you will be writing the letters all on your own. Yahooooo! Time to practice tracing and writing the lower case y. Now this is something to get excited about! Go ahead, let out a yell, or a yodel! Write a y five times on each line. Zzzzzzz. Whatever you do don't take some z's while you practice tracing and writing the lower case z. Don't be lazzzzy. Make sure you have at least five z's on each line. All together now! All the lower case a - z letters have come together on one page. 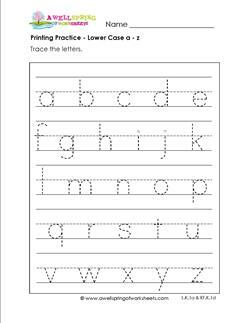 Trace all the lower case letters slowly, neatly, and carefully on the lines. This set of three pages includes all the lower case a - z letters. First trace the letter, then practice writing the letter one or two more times.